It is our connectedness that creates who we are. Carolyn noticed that I was having difficulty raising my arm. I had hurt it on vacation. It was a week before I could see my doctor. After just one session, Carolyn was able to give me hope. Her gentle style and understanding of pain and injury made a profound impact on the range of mobility I have gotten back in my arm. She takes her knowledge of anatomy and weaves it through a therapeutic yoga practice and guides you with the clarity of her instructions and the warmth of her voice. She has a passion for helping people on their journey towards healing. Carolyn is highly skilled, articulate and compassionate and I highly recommend her to everyone. - N.C. 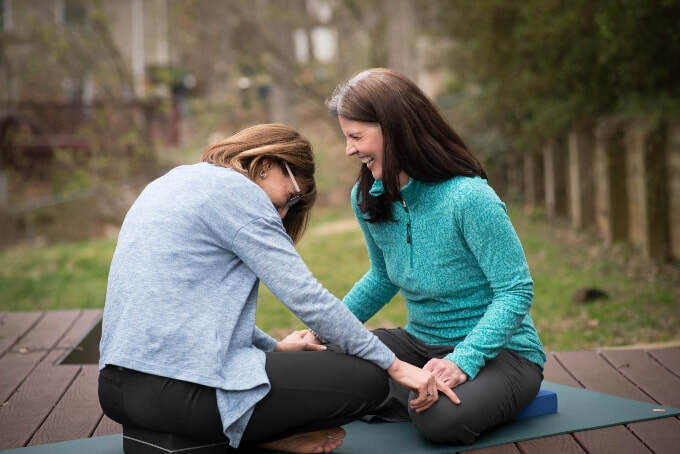 The yoga therapy that Carolyn offers is gentle and compassionate. She listens to me and pays attention to the way my body moves. The gentle movements that she teaches are easy and gentle and I even wonder how they work. I am recovering from major surgery and feel better and stronger everyday. I find it is easy to continue the movements on my own. Carolyn has been a pleasure to work with, she is very calming, caring, and truly loves what she does. - G.K.
My friend and I took 5 semi-private lessons from Carolyn. Both of us having been counseled by our doctors to build core strength to prevent further back pain, we wanted some individual instruction before jumping into group yoga classes. Carolyn was just the right person to help us. She showed us so much about proper breathing and positions so that we can maximize the benefit of group classes we will take. During each class Carolyn taught us how to 'listen' to the feedback from our bodies to recognize how each exercise should feel. We learned alternatives to poses that might not work for us individually. Best of all was Carolyn's heart for teaching. She is a caring and gifted instructor and is passionate about sharing what she knows. - R.D. I have a disability and am in a wheelchair full time. I was afraid yoga would not work for me. Carolyn created a program just for me that really reduced my pain. She took the time to get to know what I needed and what my goals were. The breathing exercises are very helpful in reducing my pain. I use them daily! I recommend the program to anyone. - J.Z. I worked with Carolyn for three sessions which she designed to ease me into the world of yoga. She taught me fundamental yoga positions and how to achieve these within the limits of my body. I found Carolyn to be wise, patient and caring. She wants me to experience the benefits of yoga and took great care to assure that I don't injure myself attempting to perform movement that my body is not yet ready to make. I highly recommend Carolyn to others as a yoga instructor and/or as a therapeutic professional. - M.B. Thank you so very much for working with my son. As you know, he had significant muscle pain and restricted motion after pulling his back at the rowing contest. Rest and anti-inflammation medications had not provided relief. Your services guided him through a process of self-awareness to foster balance within his body . . . he has specifically noted that he feels much more comfortable with the idea of calming his body and mind to increase awareness of tensions within his body and he feels more competent to direct relaxation and breath to relieve those tensions. He has returned to crew practices and he feels stronger, both mentally and physically. Thank you. - T.B.